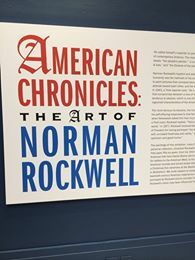 If you are in the New York/New Jersey area you have a couple more weeks to catch the Norman Rockwell exhibit at the Newark Museum. I would encourage you to do so. I found the exhibit to be a revelation. If you had asked me to name one of Rockwell’s works the first thing that would have come to mind is Bottom of the Sixth, the baseball painting of three umpires trying to decide if it is raining too hard to go on. I had thought of Rockwell as an illustrator of Americana, of God and country and apple pie. Of someone whose images easily fit on T-shirts or plates or mugs. Instead what I found at the Newark Museum was a powerful chronicler of the Civil Rights Movement. There are three works that stand out. Perhaps best known is The Problem We All Live With (1964) depicting the scene as 6-year-old Ruby Bridges becomes the first black child to enter the William Franz Public School in New Orleans. The little girl makes her way to school accompanied for four huge marshals. In the background is a wall adorned with racial slurs and the drippings of a tomato thrown in her direction. The Newark exhibit has a section devoted to Southern Justice (Murder in Mississippi) (1965). It shows the evolution of the painting with some early sketches, photos of the models Rockwell used and news stories about the murder of civil rights workers Michael Schwerner, James Chaney and Andrew Goodman, abducted and shot by Klansmen in Philadelphia, Mississippi in 1964. The painting itself shows the murderers only as shadows. The third piece, New Kids in the Neighborhood (1967), was inspired by the integration of the Park Forest neighborhood in Chicago. Two black children stand beside a moving truck and come face-to-face with three white neighborhood children. 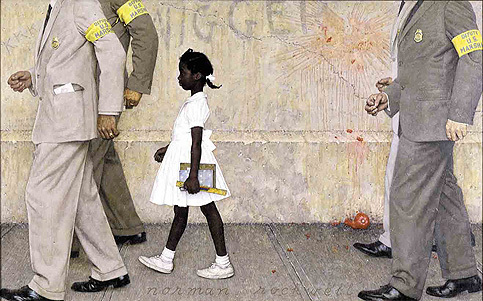 A interesting touch that Rockwell adds is that the black children are holding a white cat, the white kids a black dog. There is no trepidation or hatred on the faces of these children, instead their look is one of curiosity. The image conveys the hope of a better future as a new generation overcomes the attitudes of their parents. Rockwell has not always been critically acclaimed. Fine arts critics dismiss him as an illustrator. Some question the commercial influence on his work. 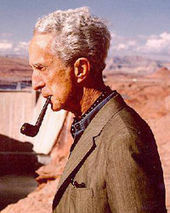 Most of his paintings were sold as magazine covers, most notably for the Saturday Evening Post, which implies editorial and possibly advertiser approval. For others the bulk of his work is seen as too sweet and fanciful. My formal art training consists of bluffing my way through a 100 level art appreciation class as a college freshman. But I can tell that Rockwell is brilliant. He is brilliant because he can paint emotion. At times in his career that emotion might have been fulfillment and contentment, but in his 70’s as he painted these civil rights inspired works, he painted bravery and hatred and hope. One critic has called him America’s Dickens. He has with his brush built an emotional connection to his characters the way Dickens did with his pen. This entry was posted in Art, History and tagged art, civil rights, history, museum, Newark Museum, Norman Rockwell, racism. Bookmark the permalink.